Recorded in several forms as shown in the recordings below, this ancient and very English name is either topographical or just possibly a nickname. Taking the former, it derives from the pre 7th century word "cnoll", or the Middle English "knol", both meaning a hill top, and hence describing a person who lived at such a place. Topographical surnames were among the earliest created, since both natural and man-made features in the landscape provided obvious and convenient distinguishing names in the small communities of the Middle Ages. A second possible origin is that it may be a nickname surname, since there are references in ancient records to the personal name of "Cnoll". This was used in the transferred sense of a short, stout person. Early recordings of the surname from both sources include: Robert de la Cnolle of Devonshire in 1185; Thomas Knolle of Cambridgeshire in 1279; and William atte Knowle of Sussex in 1296. Henry Knowles was an early emigrant to the American colonies, leaving London on the ship "Susan and Ellin" in April 1635, bound for Virginia colony. An early coat of arms has the blazon of a blue field, charged with a hawk seizing a partridge, and on the chief three blue bird. 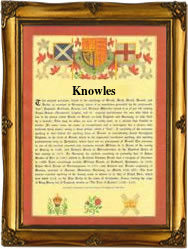 The first recorded spelling of the family name is shown to be that of Christopher Knolles. This was dated 1407, in the "Register of the Freemen of the City of York", during the reign of Henry 1V, known as "Henry of Bolingbroke", 1399 - 1413. Surnames became necessary when governments introduced personal taxation. In England this was known as Poll Tax. Throughout the centuries, surnames in every country have continued to "develop" often leading to astonishing variants of the original spelling.